Our grandchildren absolutely need to hear us talk about how God has been faithful to us yesterday. They need to hear us point out how He is faithful to us today. They also need to hear us share why we believe God will be faithful to us tomorrow. They need to hear these things. But, they also need to remember how God has been faithful to them yesterday. They need to see how God is faithful to them today. When they remember and see these things, they will be able to believe Godwill be faithful to them tomorrow. 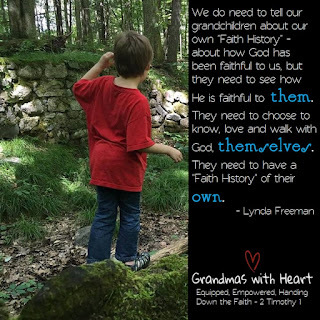 These things are essential for them to develop their own "Faith History", so help them remember - give them their own journal or set of "faith rocks" for them to record how and when God has been faithful to them yesterday. Help them see and celebrate how God is faithful to them today! Talk with them about why you all believe God will be faithful to you all tomorrow. This is what handing down the faith is all about; and it matters!